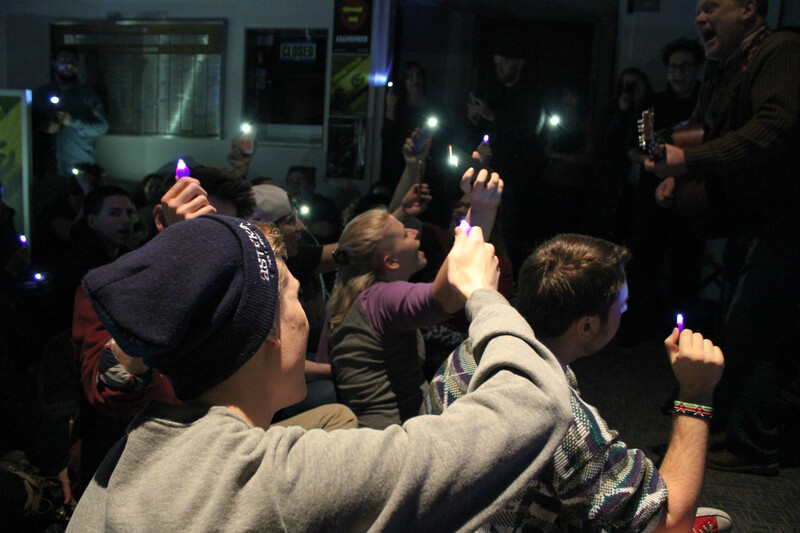 Students raise their lights to the sound of associate professor Rives Collins' guitar. Students and faculty anxiously await the lighting of the eponymous "ghostlight." 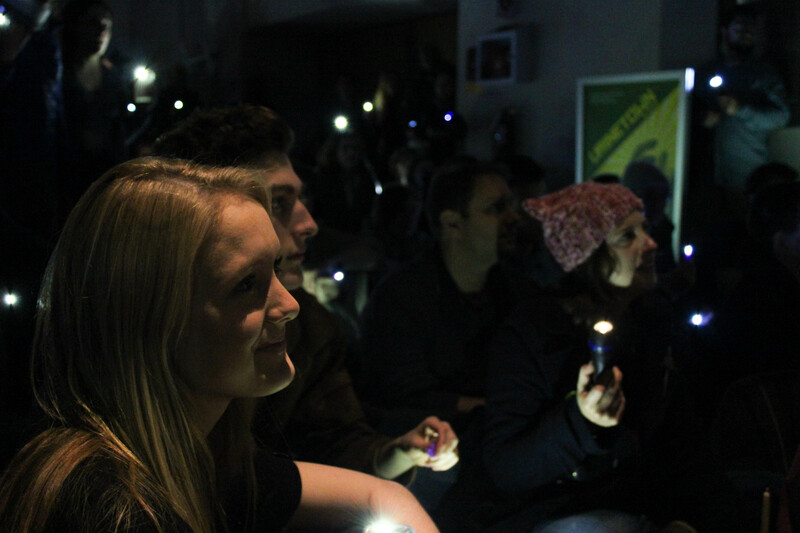 Students, faculty, alumni and others watch on during the Ghostlight Project. 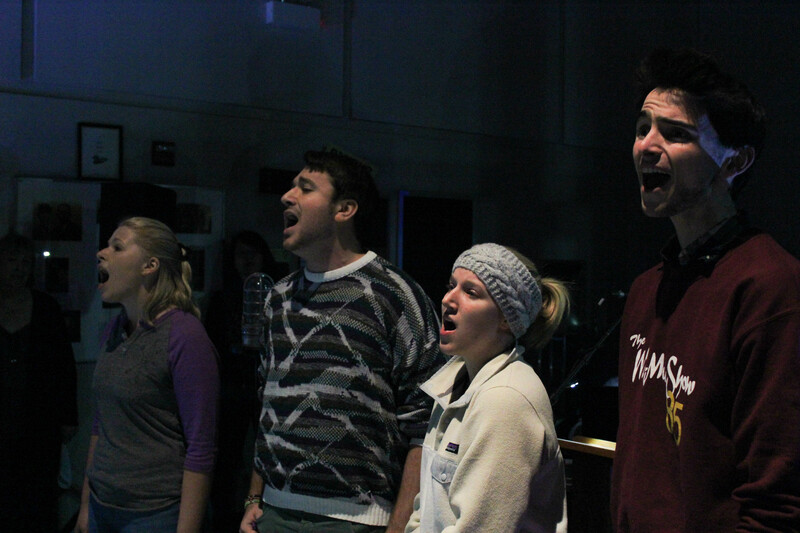 A quartet from the 85th annual Waa-Mu show "Beyond Belief" performs as part of the Ghostlight Project. 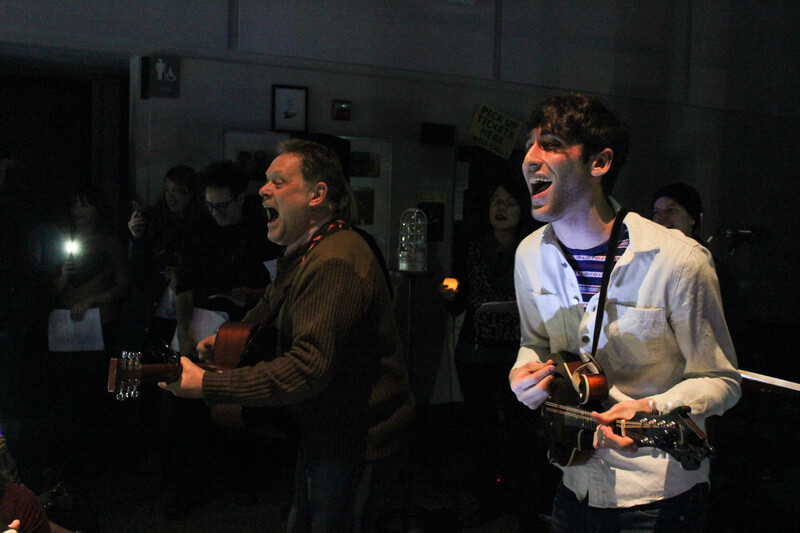 Associate professor Rives Collins, left, leads the crowd in song. The tradition of leaving a “ghost light” in an unoccupied theater reaches far back into theatrical history, and carries with it a fair amount of superstitions; although its practical use is to prevent accidents in a pitch-black theater, superstitions associated with the tradition often specify that it is meant to appease the resident ghosts. Northwestern theatre students and faculty, along with thousands of others across the country, added a modern twist to this age-old tradition Thursday night as they packed into the lobby of the Wirtz Center for the Performing Arts for the Ghostlight Project, a nationwide effort meant to create light for “the challenging times ahead” on the eve of the Presidential Inauguration. 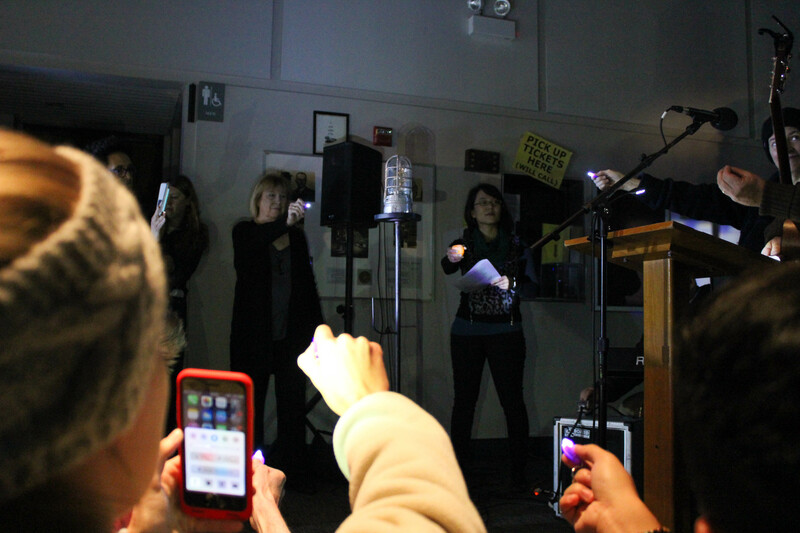 Faculty handed out small purple flashlights to those in attendance, which included students, faculty, alumni and other passionate community members. At exactly 5:30 p.m. CST, in accordance with theaters across the country, Thebus directed the crowd to shine their lights, illuminating the previously darkened lobby. In the minutes to follow, associate professor Rives Collins strummed his guitar to lead those who had gathered in singing a folk song, teaching them line by line. Following the song, representatives from the Theatre Department, Wirtz Center and Waa-Mu show listed their respective organizations’ commitments to goals like connecting with charitable organizations, holding workshops on diversity and inclusion and creating safe and welcoming spaces for artists and audience members. Expose the truth around us, tell the people what we’ve found, shine a light on the shadows. Make a path for others, fill the silence with a sound, shine a light, shine a light, shine a light on the shadows. After the students finished the song, Thebus then took to lighting the eponymous “ghostlight,” a bulb inside a metal cage to her right, before she and Collins led a procession through the theater down to the paint shop, where a full reading of the U.S. Constitution was to take place. Lee Conrads, an MFA directing student in the School of Comm, organized the reading, which she said was inspired by a conversation with her boyfriend in which both of them realized they had never read the Constitution. “What I really want from this experience for us is not so much to perform the constitution, but for us to get a chance to listen to it,” Collins said. Professor Billy Siegenfeld led the group in an energetic rendition of the Constitution’s preamble, performed in unison to the beat of stomping feet and snapping fingers. A group of students and faculty then lined up to read each and every article, section and amendment (author’s note: the Constitution is long), cycling out to let others read. Alumnus Eric Simon (Speech ‘96) attended the event and stayed to hear the entire constitution being read, and reflects on the context of the gathering as being especially poignant in light of recent events.